I’ve called this blog ‘I draw’ because my art-work is centred around The Art of Drawing. I am interested in making art about people, presence and our experience of time. I think Drawing is an especially appropriate medium for my ideas. I am an artist from Margate. There is still time to see the Trinity Buoy Wharf Drawing Prize at its present venue at the Royal Drawing School in Shoreditch, London, before it ends on the 21st February. The exhibition will then move on to Drawing Projects in Trowbridge near Salisbury. This is my piece in the exhibition: ‘Displaced Portrait no:3 (young woman in carefully repaired image)’. 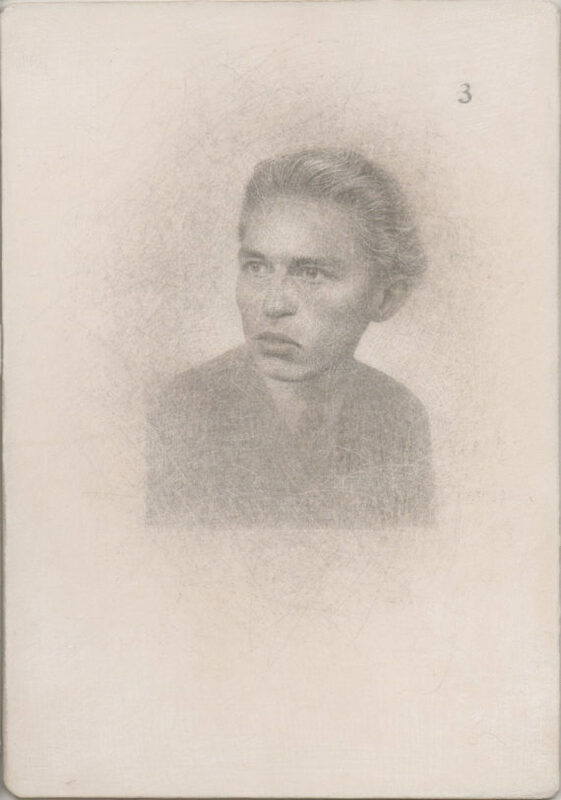 It’s one of an ongoing series of silverpoint drawings called ‘Displaced Portraits’ which are based on people seen in photographs taken mostly in Germany in the 1930s and 1940s and which I have found, at various times, in the same junk shop in Margate. See my previous posts or go to my wordpress blog for more information about this work. This is my drawing of Thomas Sidney Cooper RA (1803-1902). It’s a commissioned work for Canterbury Christ Church University’s Sidney Cooper Gallery to commemorate the gallery’s 150th year. 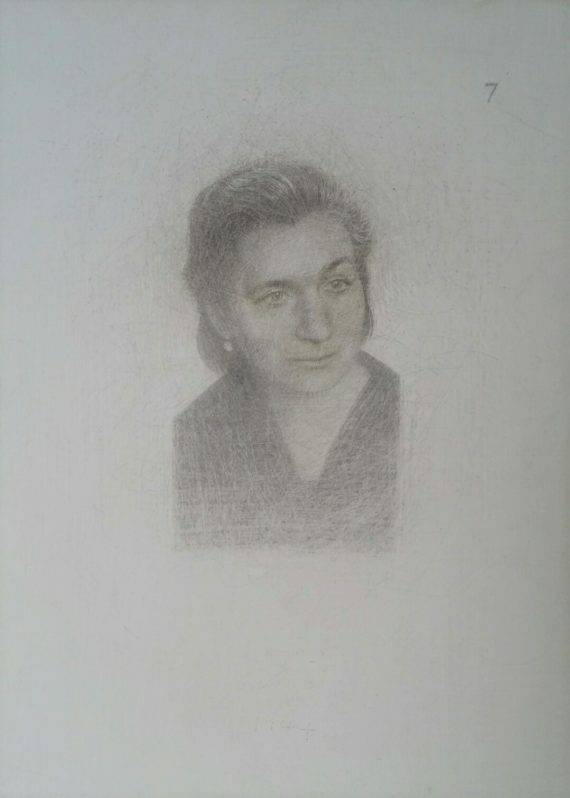 This small silverpoint drawing and it has taken forever to do and it’s the third of three attempts. It’s been such a troubled-over and time-consuming piece. Work on it has now ceased and the next time I’ll see it it’ll be framed and on display as part an installation of Sound Artist Emily Peasgood’s solo show in January. Once the exhibition is over it will become part of the university’s permanent collection of artworks. 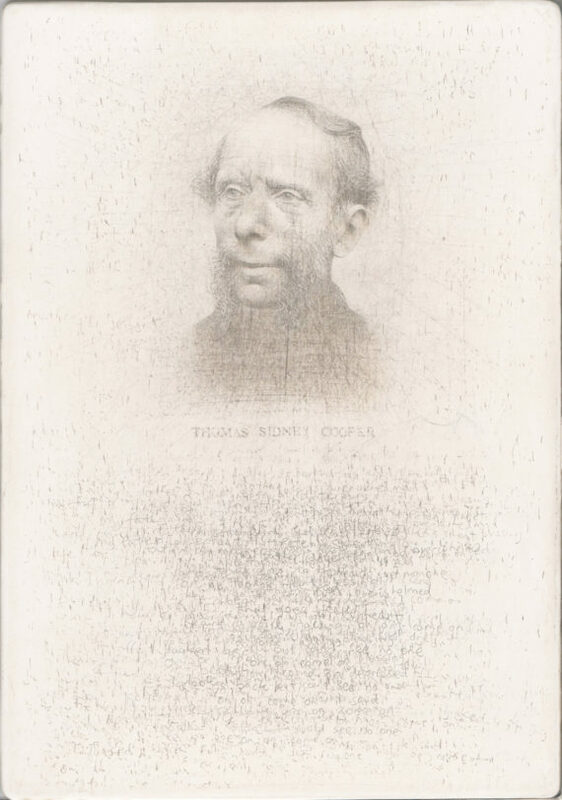 The artwork contains an image of the man and hand-written text. I’ve used a mix of different images as reference but my drawing most closely resembles a photographic image from about the time the Sidney Cooper Gallery was built. The story goes that Cooper was born in the house which is now part of the gallery and that he had a poor childhood but he became a rich and successful artist and he bought his mum’s old house, and the land around it, and had the art college and gallery built. The building was eventually given to the town to be used for art education and thus we have the present-day art gallery and studios. My portrait of him will be hung in what was his mum’s front room. I hope he would have been able see something of himself in my drawing. The drawing contains hand-written text. The lines are transcriptions from the first chapter of Cooper’s autobiography and they recall the poverty of his childhood years, various anecdotes which hint at the broader social and historical context of his time, and his repeated references to his sense of an absence of a father he never knew and who deserted the family when he was too young to have formed visual memories of him. He writes that his mum was ‘overwhelmed’ by the effort to care for her family. He also recalls his habit of walking in the countryside, alone, and how he would often feel a sense of ‘depression’ in the presence of natural beauty. On one occasion he thought he heard a voice calling “On, on; come on.”. This moment was to stay in his mind and seems to have become a kind of personal motto for him throughout the rest of his life. I love that this man gave this building to the town for it to be used for the purposes of art education. I love that the gallery and studios he has, in effect, preserved his childhood home. If it’s possible for a building to have a personality I would say that this building is affectionate. The Classical-style entrance seems to cuddle up to the contrasting domestic architecture of his former home which now houses the front room gallery and two small offices. All of the drawings and all of the artworks and exhibitions and chance meetings which have ever taken place there are down to the fact that this man took the trouble to have this place built. I think I like Thomas Sidney Cooper. I hope he would have liked my drawing. The private view of Emily Peasgood’s solo show, ‘Living Sound’, will take place on Saturday 12th January between 2pm and 5pm. Come along to it if you can! There’s less than a week to go until the opening of the Trinity Buoy Wharf Drawing Prize 2018. The Trinity Buoy Wharf Drawing Prize is the new incarnation of what used to be the Jerwood Drawing Prize. Every year I make a point of going to see this exhibtion. I think of it as a kind of survey of contemporary drawing practice. My work has been selected for it and I am very happy about that. 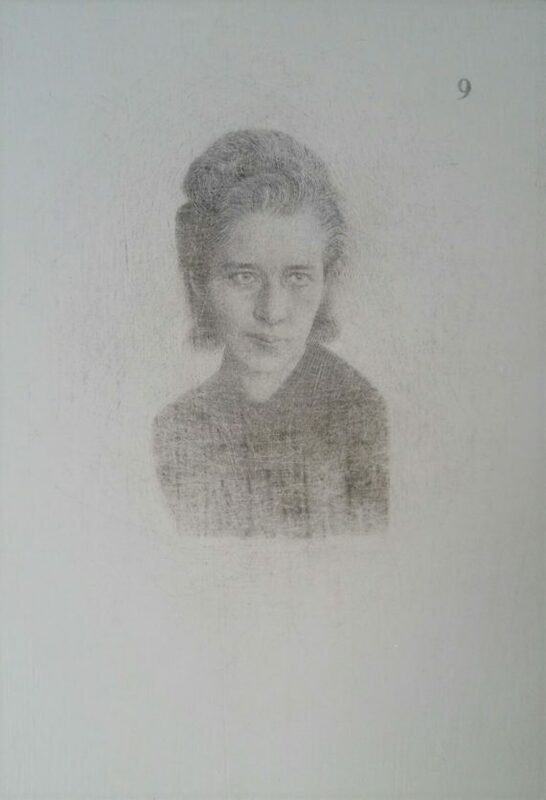 The piece is called ‘Displaced Portrait No:3 (woman in carefully repaired image)’ and it’s one of an ongoing series of small silverpoint drawings based on posed photographs of people taken in Germany in the 1930s and 1940s. 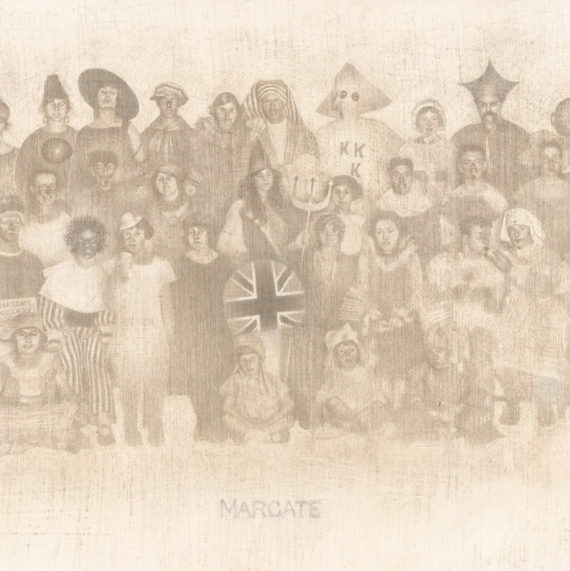 The photographs were found at different times in the same Margate junk. Somehow these discarded traces of moments in people’s lives have found their way into my hands and I have made drawings of them. Drawing is a medium which expresses the passing of time. Hand-made drawings show the physical evidence of human touch and of movement, they are the physical traces of the presence of a mind at play, thinking and paying attention to the presence of something. Drawings take time to come into being. Even the slightest trace has its life story of having began somewhere, change and finally coming to an end. Whenever we look at hand-made drawings we can experience a sense of Time’s presence. I’d like to think that my drawings put us in company with disparate moments in time and with the presence of others. Perhaps that sounds fanciful but it’s how I like to think about my Drawings. My series of ‘Displaced Portraits’ are based on photographs of unknown people (unknown to me) taken in Germany in the 1930s and 1940s. Posed photographs can capture a moment of someone’s presence. For that moment they remained still and waited for the shutter’s click. We can become very aware of our own presence in time as we wait for that moment. If, like me, you hate having your picture taken these moments can feel excruciatingly long-lasting. But these moments are just moments. My drawings take time. 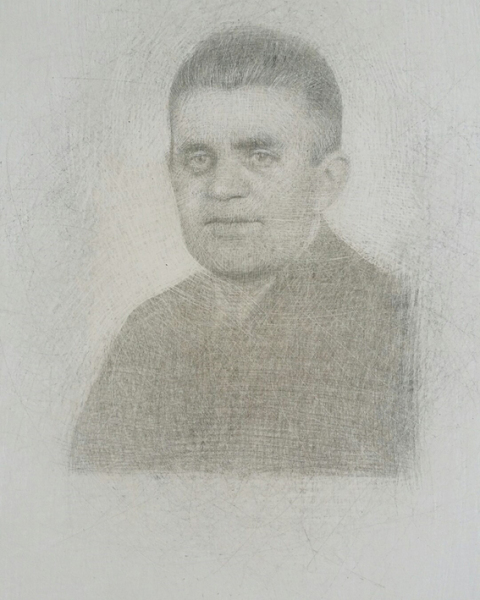 These drawings aren’t straight forward copies of photographs. Details are altered during my drawing process; a process of repeated scratching-away and re-drawing. It becomes a kind of meditation on the presence of people and of drawing and of the passing of time. What can we tell about a person from their displaced image and how are we connected with each other? ‘Displaced Portrait No: 3 (woman in carefully repaired image)’ is based on a torn photograph. The photo was ripped in two and then subsequently glued back together again. It was so carefully mended that the damage is hardly visible at first glance. What was the story there I wonder? This series of drawings is ongoing. The Trinity Buoy Wharf Drawing Prize opens from Saturday 29th September at Trinity Buoy Wharf, 64 Orchid Place, London, E14 0JY and runs until 17th October and then tours to various galleries across the country. If you’re interested in knowing more about my work you can go to my wordpress blog, ‘Roy Eastland Drawing’ (https://royeastland.wordpress.com/), or you can find me on Instagram, twitter and on my artist’s facebook page: ‘Roy Eastland’.